Have You Been To a Foreign Country In the Past Few Weeks? It’s obvious that I know that North Dakota is not a “foreign country” in the true sense of the meaning, but I’ve learned so much about the State that was foreign to me before. 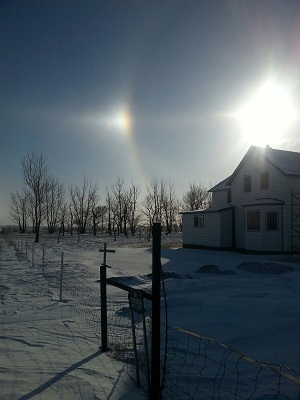 How many of you know what a “sun dog” is? Living in San Diego my dog is frequently in the sun, but that’s not what is meant in North Dakota – and other communities nearby. Sun dogs are an atmospheric phenomenon caused by the refraction of sunlight through ice crystals such as those hosted in cirrus clouds. A number of specific conditions must prevail for this phenomenon to form: the sun must be in the sky, usually less than 45 degrees from the horizon, and in the same horizontal plane as the viewer. Small hexagonal ice crystals must also be in roughly the same plane, and be oriented parallel to the ground. 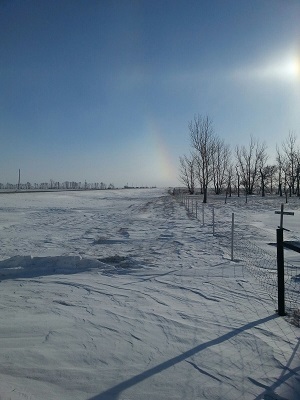 If all of the ice crystals are relatively flat, sun dogs will form approximately 22 degrees away from the sun. 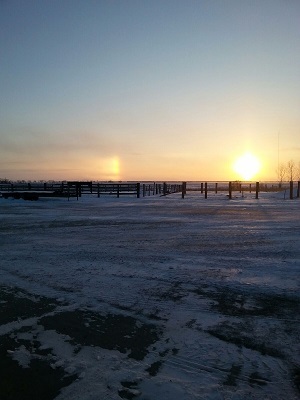 Usually, they come in pairs, one on either side of the sun, and they are sometimes accompanied by a halo, caused by the refraction of sunlight through ice crystals oriented in multiple directions. They are absolutely beautiful. My friend Cowboy took these pictures, both in the morning and afternoon. My first response was that the sun broke into two, for it looks like two suns are setting. I am working on another article about the real differences of our state and Cowboy’s, but I wanted to share these pictures with you. And, as I know Cowboy will point out to me, they are not indigenous to North Dakota. Thanks, Tricia. I am looking forward to my trip to ND in the Spring! Actually, sky watchers in San Diego document these solar reflection effects regularly. 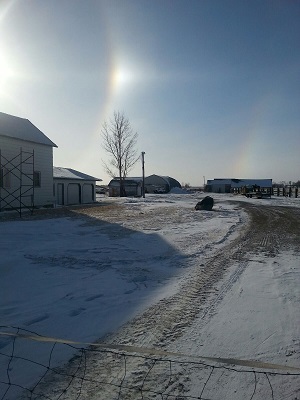 Sun dogs, solar halos and rainless rainbows are becoming very common as side effects of the Solar Radiation Management GeoEngineering Aerosol Particle Injections now re-branded as “Albedo Modification”. Look up at the sky in Southern California and watch the spraying programs for yourself, followed by greyed out sky & optical solar reflections. Newer Article: Can Eve Get Elected?